Awwww gratin and it’s with kale. Recently we went to a new restaurant in our area that has become very popular. I like their concept which is everything made fresh on site from sauces to breads and they even cure their own bacon, their beef comes from 44 different farms, and most of their ingredients are local, natural, hormone and antibiotic free. This recipe came about from something I had there that I happened NOT to like although it had a great flavor. They have a kale au gratin on the menu that they serve in cute little black iron skillets that has hardly any kale in it. 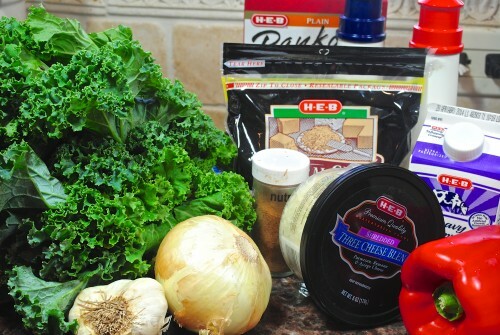 Shouldn’t any dish that starts with KALE have that has the main ingredient. 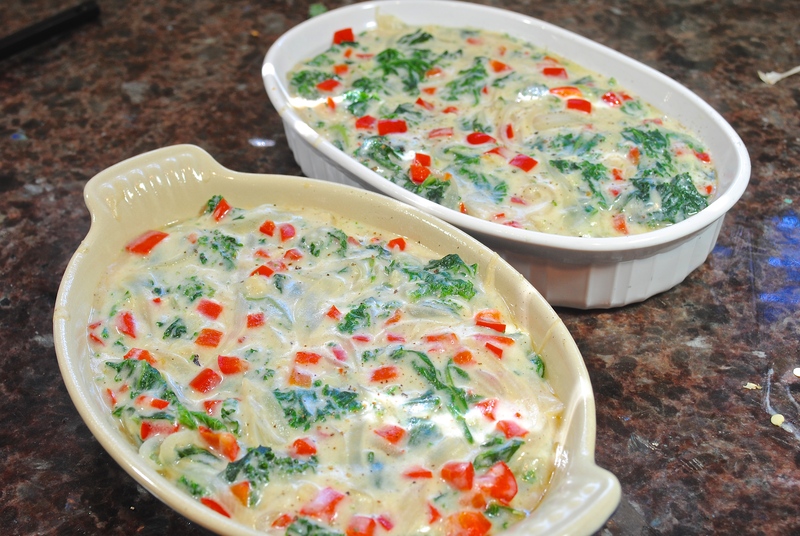 Well this kale au gratin was mostly beige with a few streaks of green through it. By a few I think maybe three small pieces of kale in the whole serving. The taste was good but the kale was MIA (missing in action). 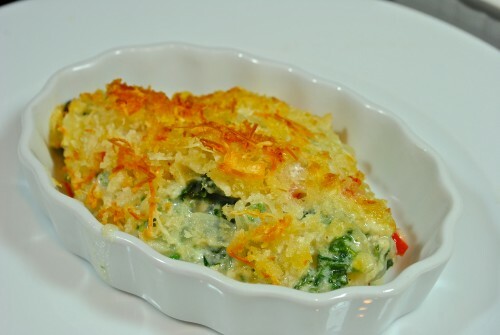 What dish isn’t made better with some cream cheese and crunchy Panko bread crumbs on top and this can be made with any kind of greens like spinach, or Swiss chard. I do want to give the restaurant another chance so I will probably order the kale the next time I’m there but I will probably say, “is there any kale in the dish”. Ok, I shouldn’t really say that because it kind of makes me a smart$$$. But I want some greens with my creamy au Gratin part of this dish. BLAST FROM THE PAST: Proscuitto Rolls is a very quick and easy appetizer that you can throw together in a moments notice. 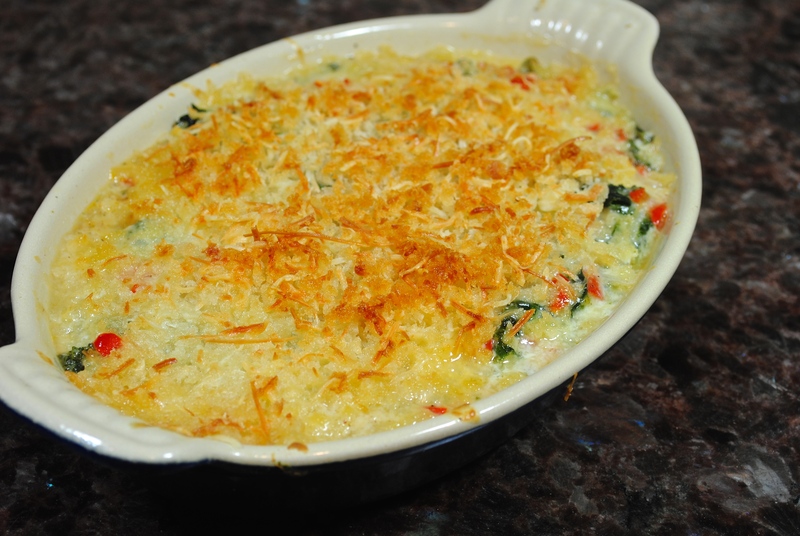 All the ingredients for this yummy kale au gratin. Saute the onions and red pepper for about 6-7 minutes. 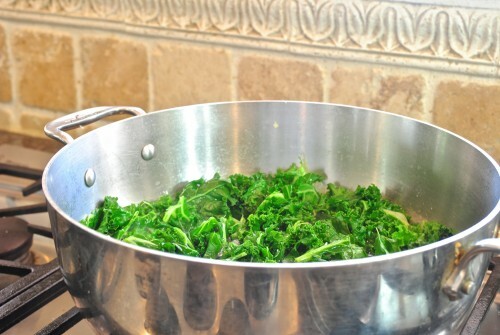 In boiling water, cooking the kale pieces for about 10 minutes or tender. Add the cooked kale to the onions and red pepper. 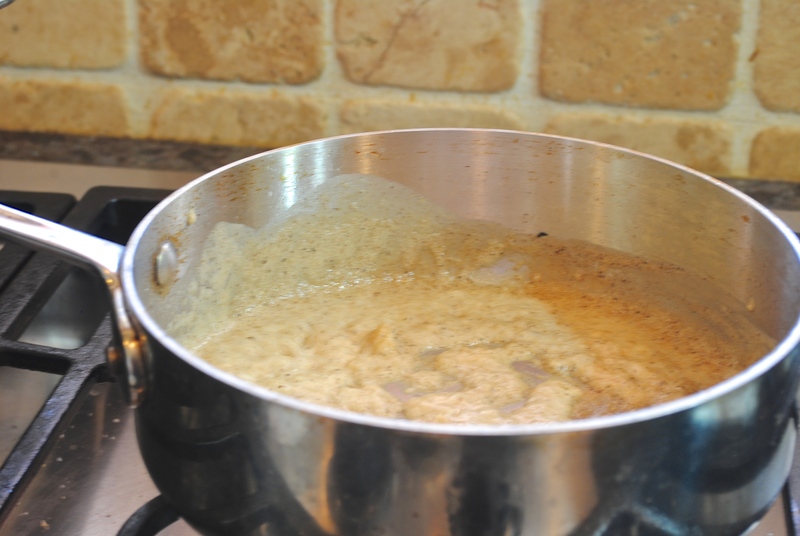 Add the flour to the butter in a sauce pan and stir until brown before adding the milk. 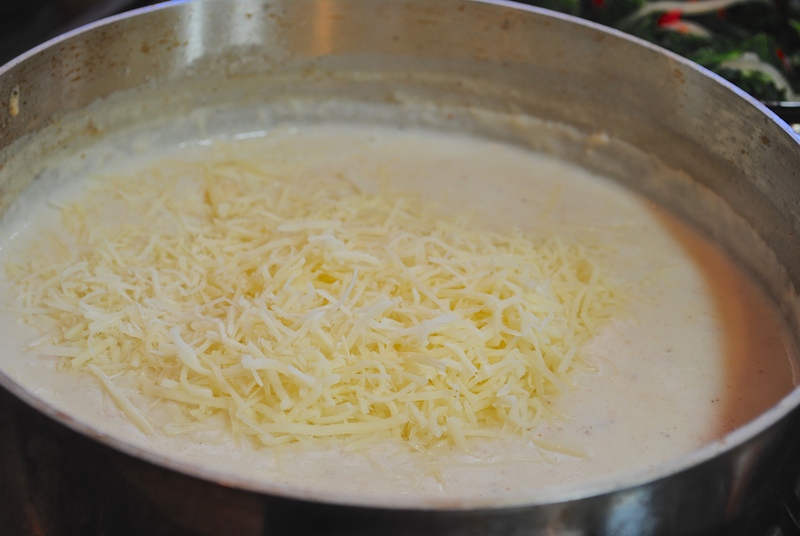 After adding the milk, stir in the cheese and whisk until cheese is melted. 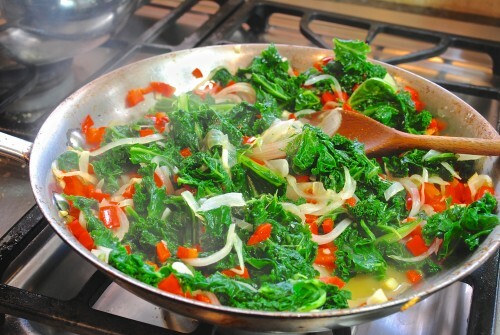 Stir the sauce into the kale and onion/pepper mixture. Pour kale mixture into butter ramekins or casserole dish. 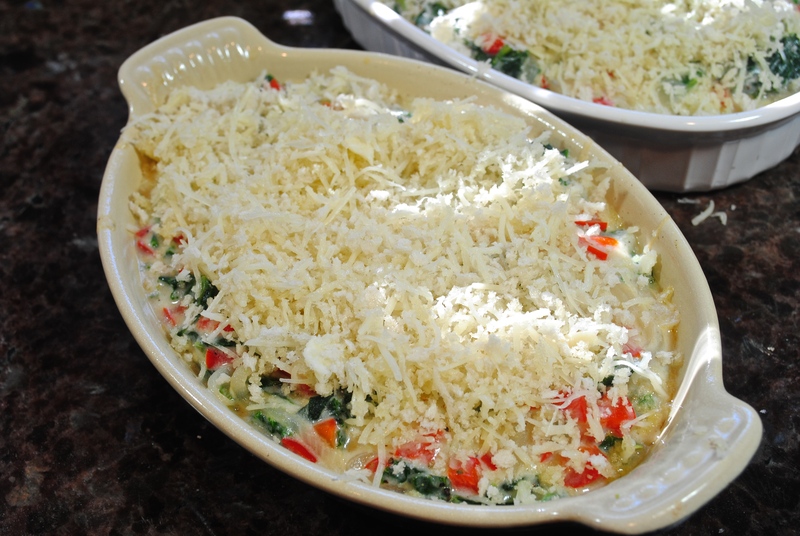 Top with the mixture of cheese and bread crumbs and put in oven to bake. Bake until browned. Serve and enjoy. Chop the kale into about 1″ size pieces. Add kale to boiling salted water and cook for about 10 minutes. Drain and set aside. 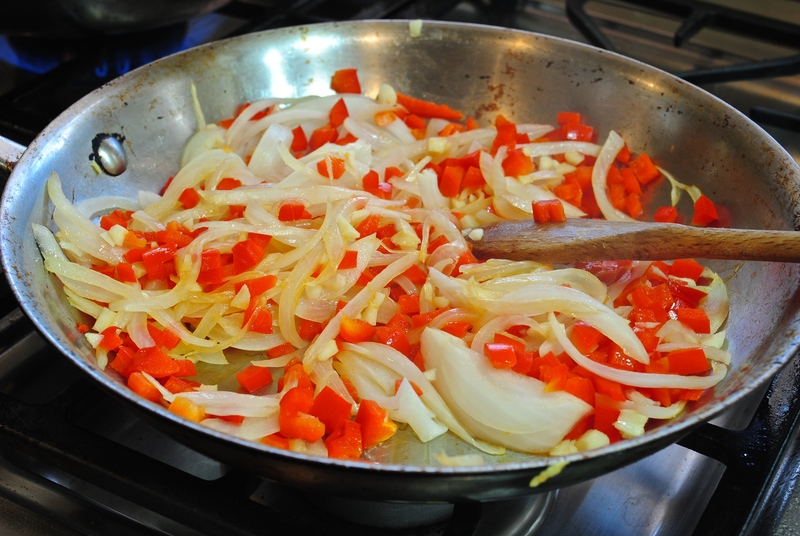 In a large pan, gently sauté onion and bell pepper in oil until soft and translucent. Add garlic and cook until fragrant. Add the cooked kale to the onion/pepper mixture and set aside until you have make your sauce. To make the sauce: melt the butter in a pan, stir in flour, and cook for a couple of minutes over gentle heat. 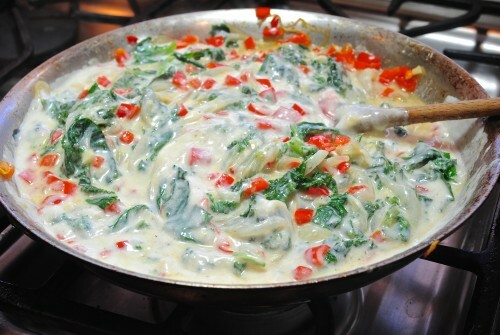 Gradually whisk in milk to make a smooth lumpless sauce and stir until thickened. Turn off the heat, stir in half the grated cheeses. Season, with pepper, nutmeg and a little salt if needed. Swipe a gratin dish with smidge of butter. Stir most of the sauce into the kale/onion mixture. Turn into a buttered gratin dish, spreading the last of the sauce on top. Mix cheeses with the breadcrumbs and strew them on top of the dish. Warm kale gratin through in a 370 F oven, about 20 minutes. Before serving, trickle cream around the inner rim of the gratin dish. Pass briefly under a hot broiler (watching) to finish crisping and browning the top. Looks great. Can hardly wait to try it. What restaurant did you go to? Lynn, we went to Fieldings Grill on Research. I really want to try it again but may ask “does it have any kale in it”. If if it doesn’t I may do something I never do and send it back. I like the restaurant though.